The objective of this programming assignment is to experience the use of inheritance in Java and to see how polymorphism works with inheritance in Java. The assignment involves writing three classes, plus a test class. The base class is a TaxableWorker class which contains a couple of attributes and methods common to all workers. The first derived class is a StateTaxableWorker which adds state tax information to a TaxableWorker. The second derived class is a LocalTaxableWorker which adds local tax information to a StateTaxableWorker. The test program will be structured to include a method which accepts a base class reference and demonstrates polymorphic behavior. NOTE: None of the first three classes below do any user input or console output! User input and console output are only done in the test program! 1. A TaxableWorker contains a name, an hourly pay rate (ie. 12.50/hr), and a federal tax rate (ie. 0.25). An explicit value constructor must be provided to set all three values. There must be mutator methods to change the values of the pay rate and the tax rate. There must be ONE workerInfo method that returns a string containing the name, hourly pay rate, and federal tax rate. There must be a grossPay method that takes the number of hours worked as a parameter and calculates the gross pay (hours * payRate) and returns that as a double. There must be a taxWithheld method that takes a gross pay amount as a parameter and calculates the tax withheld (grossPay * taxRate) and returns that as a double. 2. The StateTaxableWorker class inherits from the TaxableWorker class. This class adds attributes for the state name and the state tax rate (ie. 0.05). An explicit value constructor must be provided to set the three values of the base class plus the values for the state name and state tax rate. A mutator method must be provided to change the value of the state tax rate. The base class workerInfo method must be overridden to include all the base class worker information plus the state name and state tax rate information. The base class taxWithheld method must be overridden to include the base class tax withheld plus the state tax withheld (gross pay * state tax rate). 3. The LocalTaxableWorker class inherits from the StateTaxableWorker class. This class adds attributes for the city name and the city tax rate (ie. 0.025). An explicit value constructor must be provided to set the three values of the base class plus the two values for the state name and state tax rate plus the city name and the city tax rate. A mutator method must be provided to change the value of the city tax rate. 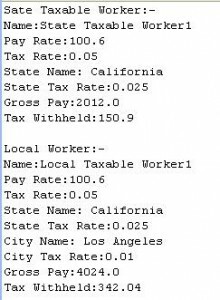 The base class workerInfo method must be overridden to include all the state worker information (which includes base class info) plus the city name and city tax rate information. The base class taxWithheld method must be overridden to include the state tax withheld (which includes the base tax withheld) plus the city tax withheld (gross pay * city tax rate). 4. The test program needs to create a StateTaxableWorker object and a LocalTaxableWorker object. The test program must contain a display method which takes a base class TaxableWorker object reference along with the number of hours worked by the worker. The display method should use the base class workerInfo method to get the name and tax information about the worker and output that information. The display method should also use the base class grossPay method to get the pay info for the worker and display that information. Then the display method should use the taxWithheld method to output the total amount of tax withheld for the worker. The test program should pass the StateTaxableWorker object and the LocalTaxableWorker object to the display method along with the number of hours each worker has worked. The output seen should demonstrate polymorphic behavior, that is the base class TaxableWorker reference to a StateTaxableWorker object elicits StateTaxableWorker tax information and correct tax withheld, and the base class TaxableWorker reference to a LocalTaxableWorker object elicits LocalTaxableWorker tax information and correct tax withheld. Take screen shots of the output of the program. Paste the screen shots and your source code for all your classes into a Word document. Hey, the lab 1 i purchased was great. I need this one too. Can you five me a dsicount. I will purchase the whole course from you. please contact me on support@iqrajavaid.com. How have you implemented inheritance in the code?